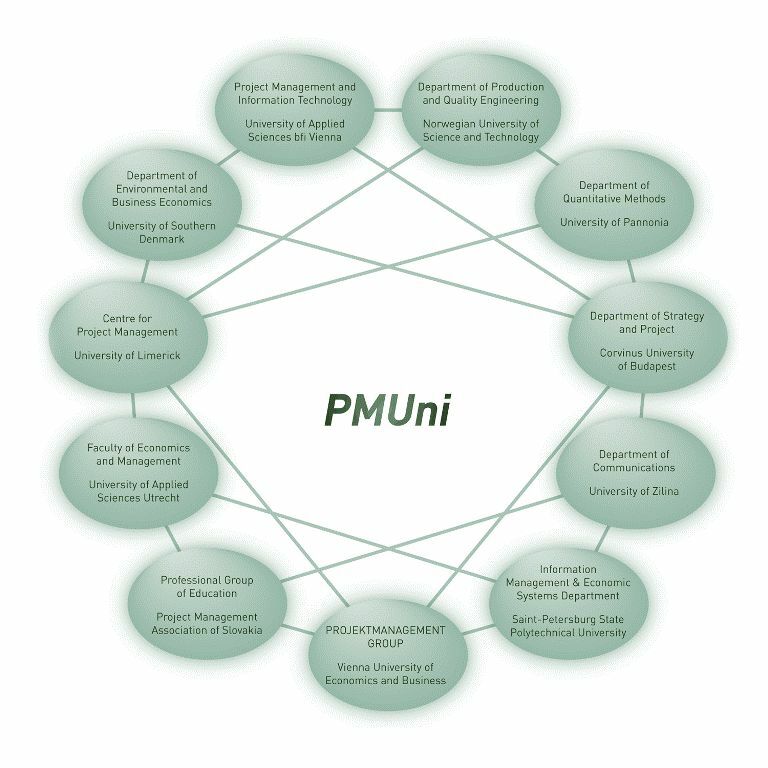 PMUni is a social network of partners with the objective to promote professional education and research in process and project management. PMUni as a social network. PMUni deals with the topics process and project management, but also programme management and management of the process and project-oriented company. Only organizations can become PMUni partners. The PMUni partner provide information about their education and research activities. The PMUni Board consists of representatives of the PMUni partners. Every PMUni partner chooses a representative as a PMUni Board member. The PMUni Board determines a chair person and a deputy chair person. The role of the PMUni facilitator will be held by one representative each from the PROJEKTMANAGEMENT GROUP and STU Bratislava. The performance of the facilitator role is not limited in time. If the facilitator step back or are asked to step back by the PMUni Board, any other PMUni partner can become facilitator. The PMUni Board shall meet once a year to decide on the strategic direction of the network. Periodically workshops of PMUni partners will take place. The PMUni facilitator employs part-time personnel for providing its services. The PMUni facilitator maintains the PMUni homepage. The PMUni facilitator provides the postal address and email address. The PMUni partners provide meeting and event facilities, due to the possibility. order to finance the facilitators services.